Almost all trees are susceptible to cankers, a disease of the bark or wood of a tree, caused by the Nectria fungus. It is most common in regions with a cool, humid climate. Where is occurs at relatively high elevations, it is most common on exposed slopes with shallow or infertile soils. At low elevations the disease is common in cold pockets and on poorly drained soils. Nectria Canker requires bark injury such as a wound from frost cracks, sunscald, or pruning. Infection is more likely in wounds that occurred in autumn and winter than those sustained in late spring and summer, although infection can occur at any time throughout the year when temperature and moisture permit. 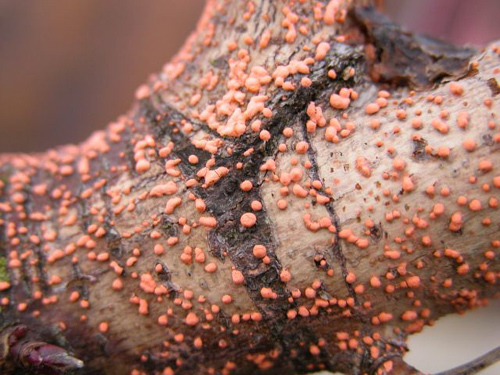 Much of the damage by Nectria Canker can be prevented by planting trees or shrubs known to be well adapted to the climate of the planting site. To aid the prevention of damage in trees and shrubs that have already been planted, minimize water stress by ensuring proper drainage and avoiding over-watering, and also avoiding untimely pruning or other wounding. Removal of trees may sometimes be the only option. For control on Japanese maples, three chemical applications in the later weeks of winter and early spring will also control this disease. First application is to be done in late winter. Second application a week after that and the last application two weeks after the second.